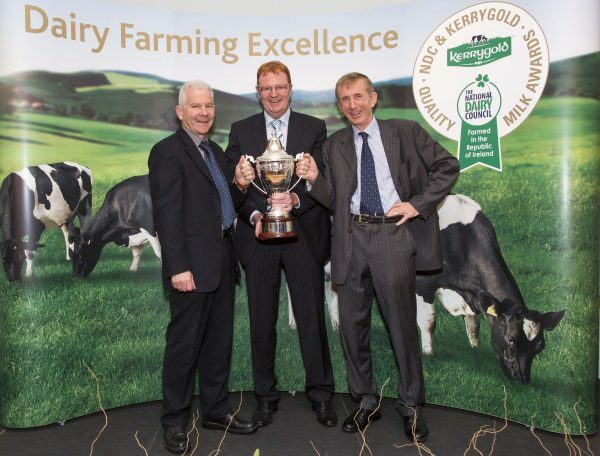 The search for this year’s top dairy farmer has started with the launch of the 2013 NDC & Kerrygold Quality Milk Awards. The national competition invites dairy co-operatives throughout the Republic of Ireland to nominate their top dairy farmers for the title. The current champions are David & Kathleen Cassidy who run a family farm at Coppenagh, Lisnagar, Cootehill, Co Cavan. The family supplies milk to Glanbia to make Baileys Irish Cream. Pictured with 'The Sam Maguire of Farming' are (L-R): Dr David Gleeson, Milk Quality Research, Teagasc; Dr. Jack Kennedy, Dairy Editor, Irish Farmers Journal and Professor Patrick Wall, Associate Professor of Public Health at UCD - The independent national judging panel for the NDC & Kerrygold Quality Milk Awards. The search for this year's top dairy farmer has been launched (details www.qualitymilkawards.ie ). Top quality milk remains at the heart of awards, known as The Sam Maguire of Farming, but the competition also takes on board the broader aspects of excellence in contemporary dairy farming. The judges retain the option to highlight, through category awards, specific areas of excellence which they believe demonstrate best practice in areas such as animal welfare, care of the environment and sustainability. Co-ops and dairy advisors can get copies of the 2013 nomination forms at www.qualitymilkawards.ie or by calling 01-290 2451. The closing date for nominations is 30th April, 2013, with these technical forms used by the judges to select a short list of farms. The judges then arrange to visit the farms of short listed national finalists for a review and inspection as part of their decision making process. The independent national judging panel for the NDC & Kerrygold Quality Milk Awards features: Professor Patrick Wall, Associate Professor of Public Health at UCD; Dr David Gleeson, Milk Quality Research, Teagasc; and Dr. Jack Kennedy, Dairy Editor, Irish Farmers Journal. Both liquid and manufacturing dairy farmers in the Republic of Ireland may be nominated for the awards. The minimum qualifying standard for entry is average TBC 20,000 or less/ml average per month; and average SCC 250,000 or less/ml with no count over 400,000 ml in any given month of the year in question. Further information about rules and the number of nominees which can be submitted by dairy co-ops are published in full on the entry forms. The overall winning farmer will receive a prize of €5,000 and the NDC & Kerrygold Quality Milk Awards perpetual trophy.